In this blog, you learn how to compare bank loans, understanding the different interest rate benchmark and the documents you need for a loan. You will learn the many financial jargon and understand how financing work. For one of the biggest debts in your life, it is worth the extra effort to know more. It is a follow-up to my earlier post on buying an executive condominium. We are going to start by comparing the various bank loans. Only by seeing the different loans then you will know what to look for and ask. There are several websites that will help you with choosing a loan: smartloans.sg and icompareloans.com. You input the cost of the house and the amount of loan that you intend to take. 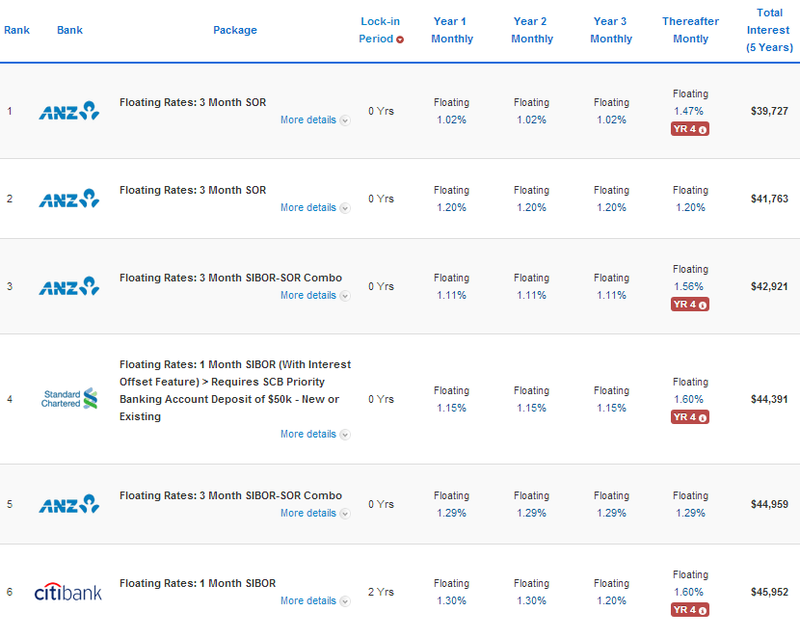 After submitting, you get a list of loans with different interest rate from various banks. Personally, I like smartloans better because it has more details and it presents the details professionally. The downside is you need to enter your mobile phone number which means giving up some of your privacy. Above is the list that I generated for myself from Smart Loans. It lists the different loans package in order of the smallest amount of total interest paid first. In this screen, I am showing the total interests for 5 years because it gives you a clearer picture of what you will be paying. Some banks will give you a lower interest rate for the first 3 years to make their package more attractive. However, the thereafter monthly is equally important because the rate is much higher (the first years are to entice) and you may not have the choice to refinance. If you are getting a loan for a property where it is under construction, having a lower interest rate for the first 3 years will not net you much saving compared to the thereafter rate. Going by a progressive payment schedule, you will pay much lower interest at the start and the monthly payment slow increases as the loan is disbursed for each phase of construction. (Please see this section on progressive payment). At the time of my application, DBS is giving a rate of 0.8%, 0.8%, 0.8%, 1%, 1.25% thereafter. For Citibank, their loan was 0.95%, 0.95%, 0.85%, 0.85%, 1.25% thereafter. My apartment is currently under construction so the loan is disbursed over the next 5 years. Going with the Citibank Home Saver loan saves me a little. There is a lock-in period set by the banks: this means you cannot do prepayment during this period or it will result in penalty. While most banks have zero lock-in period, Citibank has a 2 year lock in period. The main feature of the Citibank SIBOR loan is the ability to switch between 1/3/6/12 month SIBOR at anytime with zero switching fee. I will discuss on this helps in the later sections. 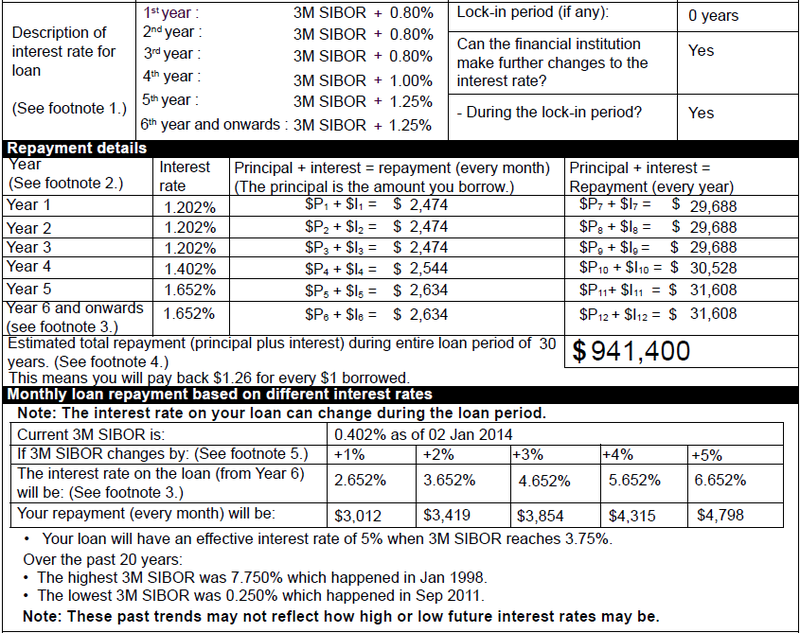 Bank loan interest rate comes in different flavours: floating rates (SIBOR, SOR) and fixed rates. SIBOR and SOR are rates used as a benchmark by the Banks to decide the interest rate of your loan. The bank will quote a spread plus the SIBOR rate. For example, 1M SIBOR + 0.8% means the bank used the rate of the 1 Month SIBOR and adds a spread of 0.8% on top. If the 1M SIBOR was 0.3% on 1st Jan, you will pay an effective interest rate of 1.1% for the month of January. Fixed rates are a fixed set of rates for a number of years before it becomes floating. If DBS states that the rate is 1.99% for the next 3 years, that is what you will pay for next 3 years. Homeowners will choose a fixed rate when they want stability and a peace of mind. With the current low interest rate, fixed rate is not the best choice. This is why there are only 2 banks offering fixed rates packages. When the interest rates starts going up, we can expect to see more fixed rates packages. Another floating rate package is the HDB Concessionary Loan that pegs the interest rates to CPF Ordinary Account interest rate + 0.1%. This is fixed at 2.6% for as long as I can remember. 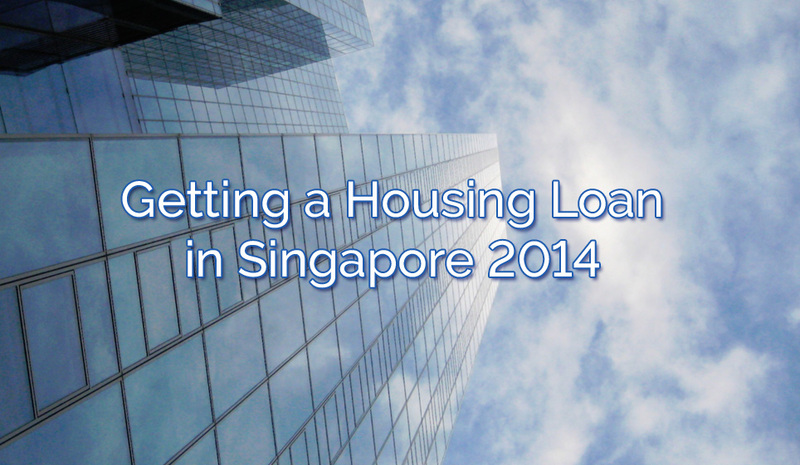 Most of us will be taking a bank loan as HDB has strict loan eligibility and it applies only to HDB flats. After doing your research online, you have a slight idea on which banks to approach. Choose a bank and banker that you trust. The banker must be able to explain to you every detail of the loan. If the banker don't know the details by heart, I will be wary. Before you go off and do that, I want to touch on SIBOR and SOR because there is little discussion online and I feel this is an important part of choosing the right loan. SIBOR stands for Singapore Interbank Offered Rate and it is the rate that Singapore banks are willing to lend money to each other. Every business day, a panel of at least 12 Contributor Banks will contribute rates for the SIBOR for maturity of 1 month, 3 months, 6 months and 12 months. After collecting the rates, the top 25% and bottom 25% are discarded. The middle 50% is averaged to derive the mean rate and becomes the SIBOR rate for that day. Although the panel of banks are not disclosed, I believe the 12 banks are: Barclays Bank PLC, Citibank N.A., Credit Suisse AG, DBS Bank Limited, Deutsche Bank AG, HSBC Limited, Malayan Banking Berhad (Maybank), OCBC Limited, The Royal Bank of Scotland PLC, Standard Chartered Bank, United Overseas Bank Limited, UBS AG. The interest rate is charged on a Actual/365 day count basis. If there are 31 days from 8th Jan to 8th Feb, then the interest rate will be 31/365 multiply by the SIBOR rate on 8th Jan.
Disclaimer: the information above is based on my research online and my bank experience. You should verify any information on your own. My research sources: ABS Trading Protocol (Appendix A), SGX Interest Rate Swaps, CondoSingapore News Excerpt. The reason for using SIBOR as a benchmark is to provide transparency to borrowers. The method of calculation ensures that the rate does not get skewed by dubious contributions at the top and bottom percentile. However, this is not to say the banks may not corroborate to push up the SIBOR rates. The LIBOR scandal was discovered in 2012 where the London banks manipulated the LIBOR rates. This resulted in criminal settlements and fines were dealt to the banks. The SIBOR rate is published daily and you can get the rates online, Reuters (screen ABSIRFIX01) or through the Business Times. SIBOR was first used as a benchmark for housing loan in 2007 and thus it is relatively new to the scene. Prior to that, the Bank's internal board rate was used - a value that the bank derives internally. This may sound dubious now but it's what borrowers have to live with in the past. 1M vs 3M SIBOR: Which is better? If you ask around which is better, including your banker, they will tell that 3 month SIBOR is subjected to lesser fluctuation and it is generally safer. However, is it really better? I will give you an analysis based on actual data and let you make the decision for yourself. You can get the historical SIBOR rates from MAS Domestic Interest Rate page: select "Interbank 3-month" for the 3 months SIBOR. From the data, the 1M SIBOR is lower than the 3M SIBOR about 76% of the time (based on monthly data). A 3M SIBOR is higher because of the uncertainty. If you are going to loan someone money for 3 months, you will quote a slightly higher rate because you do not know what the rate will be in 3 months time. If there is sudden change in rate, you cannot react to the risk or opportunity in time. Hence, the higher spread between the 1 month and 3 month makes up for that uncertainty. The longer the length of the loan, the bigger the spread. The 12M SIBOR (red line) is higher than 3M SIBOR most of the time. Why does your banker or agent say that a 3M SIBOR is better because there is less fluctuation? It is true that 1M SIBOR has more fluctuations because it is more reactive to the overall state of the world economies. But is it better? 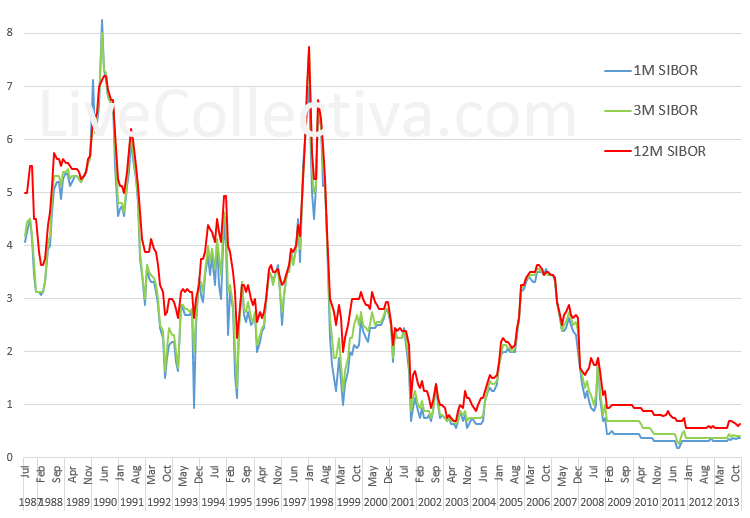 For example: on 8 Jan 1998, the interest rate went up to the highest: 1M was 20%, 3M was 14% and 12M was 12%. If you got locked in on that interest rate that day, you are the most unlucky person. It seems like 1M is a bad choice. However, your housing loan is a long-term thing. On 9 Feb 1998, 1M rate went down to 6.75%. With a 3M SIBOR loan, you get locked in at 14% for the next 3 months. The verdict is: a 3M SIBOR is better than 1M SIBOR when the interest rate consistently goes up every month because you get locked in for 3 months and the rates goes up on the 2nd and 3rd month. Once the interest rate stabilizes or falls, the 1M SIBOR will be better than a 3M SIBOR. In the end, it all comes down to chance. When you are taking a loan for 30 years, you are getting more chances where the 1M SIBOR is better. If the 1M SIBOR is superior, will anyone take up a 12M SIBOR? Absolutely. When there is very clear signals that the interest rate will go up, a valid strategy is to lock yourself into 12M SIBOR for stability. Right now, the US Feds is sending out the message that they will wind down their bond buying program which raises the interest rate. The difference between 1M and 12M now is 0.24% which I think the premium is worth paying for that stability. If you are employing this strategy, you should use the Citibank Home Saver Loan that lets you switch between 1M, 3M, 6M, 12M with zero cost. SOR stands for Swap Offer Rates and it is another benchmark that Singapore banks can use, albeit less commonly. The description for SOR by ABS is: "the synthetic rate for deposits in SGD, which represents the effective cost of borrowing the SGD synthetically by borrowing USD for the same maturity, and swap out the USD in return for SGD." What...? If you are lost at the second mention of synthetic, I don't blame you. Let me try to explain in layman terms. Swap is a financial derivative that lets you exchange your stuff for someone else's stuff. In this case, we are exchanging SGD interest rates for USD interest rate. For example, we borrowed USD $100K and pay interest on that. With that borrowed USD $100K, we exchanged for SGD $130K based on an exchange rate of 1USD to 1.3 SGD. With that SGD $130K in your hand, you loan this money to someone else and earn the interest in SGD. Did you see how we just swap paying SGD interest rate with USD interest rate? Except in SOR, the exchange never really took place. We are only simulating the rate if we actually do the swap. Hence, you keep seeing the word "synthetic" because the swap never happened at all. The second part is getting the interest cost of borrowing USD. The USD Rate refers to USD LIBOR rate, gotten from the LIBOR01 Reuters screen. The day count convention for LIBOR is 360 in a year, hence 360 is used. When the USD interest rate is low, SOR is a good opportunity. For the past three years, the US Feds ran their Quantitative Easing (QE) program to keep the borrowing rate low. It has forced the SOR into negative territory and this means bad business for the banks (see this blog post). A lot of banks have stopped offering SOR home loan packages. As far as I know, ANZ is the only bank continues to offer SOR packages. Now that the US Feds has given sign of tapering the QE program and we can expect the rates to go up in the near future. Factor this into your strategy if you are going for SOR. There are many documents to prepare and paperwork to fill when taking a bank loan. It works in your favour to have a clean credit history too. Any doubts that the bank has on your credit status can affect the amount of loan you can borrow. You can get a credit report of yourself by visiting the Credit Bureau website and paying $6 online. This is only necessary if you have been late on your credit card payments and you need to know your credit score. After speaking with the banker, you will get an idea of how much you can borrow. The banker will give you a Property Loans fact sheet based on the loan amount. This is a requirement from MAS. In the fact sheet, you will get a estimated amount you have to pay each month based on the interest rates. It also has the estimated monthly pay if the interest were to rise by 1%, 2%, 3% and so forth. I like this fact sheet because it makes you aware of the possible scenarios you have to prepare for. The bank needs a valuation report on the value of your property and will cost between $100 to $200. The borrower's name and mailing address. The address of the property that the letter is for. Interest rate spread for the 1st, 2nd, 3rd and 4th year onward. The minimum effective interest rate if there is any (in the case where SIBOR becomes negative). The rest period for the loan. Is the loan monthly-reducing or annual-reducing? The default or late charges when you do not pay. The interest can be as high as 3% plus the bank's board rate. The lock-in period before you can make prepayment. Most bank do not have lock-in period for building under construction. Until the loan is full disbursed which is at year 4 or 5, fully prepaying the loan will have charges on the undisbursed amount. The refinancing rate. This is usually about 0.5% of the outstanding amount. Some banks give free conversion. The fire insurance that you have to buy: the annual fee and the company providing it. If you are buying an EC, it should also state that if HDB does not approve your application, there is no charges for cancelling the loan. The letter of offer is around 10 pages and the banker should go through every terms. If he/she cannot explain in layman terms or answer your question, that should raise a red flag. To accept the letter of offer, you and your partner needs to sign on every page. This ensures that you signing for and accepting that page. We want to avoid a situation where a single page is swapped out for a slightly different term. Other document that needs to be signed are the MAS declaration, the application form and the fire insurance. I got my loan from Citibank after looking around several banks. The banker's service was professional, prompt and you can see that she is taking care of things for you. She was able to answer my questions readily which gave me more confidence. When I asked for a law firm that was nearer to my workplace, she went and looked for one. What I also liked is the repayment schedule that was done up that shows how the payment changes as the loan is being disbursed over the years If you need my banker's contact, leave a private message and I will get back to you. Disclaimer: I do not work for Citibank. This counts as a referral and they will give me a shopping voucher if you take up a loan. Taking a bank loan is a requirement for many of us that is buying a home. It is a complex exercise that becomes simple once you break it down into smaller portions. After reading this post, I hope that you are better prepared to go through the process now.